If my life turned out the way I wanted when I was younger I would have been blonde-haired, blue-eyed, big-boobed and pale-skinned like all the other Southern California robots I grew up. I love my brown hair and eyes, and I love my tan that never goes away. As a child, all I wanted was to never be noticed, never stand out and always be looked over. Some things don’t change. I would have been a waitress, a ballerina, Wonder Woman, a private detective, a mermaid, a lawyer, a nutritionist, a mom, a teacher, a wife, and psychiatrist. These days I feel like Wonder Woman, play private detective sometimes, act like a lawyer with some people, am a mom-teacher-wife, and see a psychiatrist. I would have traveled around the world by now, and according to the game MASH I would have married the most popular boy in school, be driving a Corvette and living in a mansion. I don’t remember who the most popular boy in school was at the time, don’t want to pay the insurance on a Corvette and definitely don’t want to clean a mansion. I would have given anything back then to make sure my life now would be Perfect — whatever that is — only so that I could know I succeeded in making my parents happy. 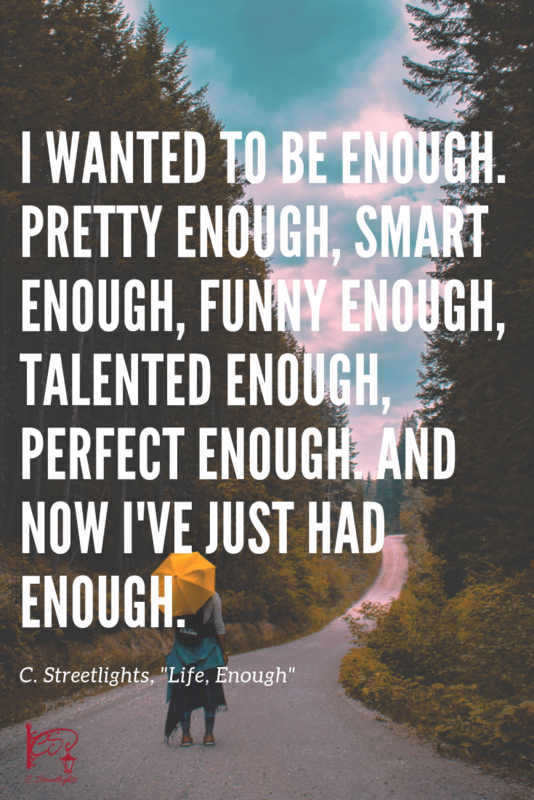 I wanted to be Enough. Pretty enough, smart enough, funny enough, talented enough, perfect enough. And now I’ve just had enough. As a child I wanted so badly to have a houseful of kids that I could love and laugh with. I wanted to cuddle and feel tiny arms around my neck. I wanted to feel some kind of closeness that I knew was out there. I didn’t know as a kid that bodies sometimes just don’t work or cooperate. As a child I knew my home wouldn’t have yelling or angry silence. It wouldn’t have spite or glares. There wouldn’t be discomfort or edginess from elephants being in all the rooms. I had long planned my home would be warm and inviting, where people could touch the walls and pick things up off tables. A place where family pictures were on the walls. A house with color on the walls other than white. All this has come true. There were so many countless hours spent with my chin resting on the side of the pool, my body weightless in the water. I can see myself even now. My neighborhood was silent except for a dog-barking every once in a while. Hardly any kids, and it wouldn’t matter if there were as I wouldn’t be allowed to play with them anyway. I’d close my eyes and think about the laters in life. I wouldn’t ever be lonely when I’m old.